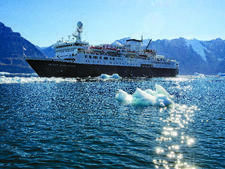 Owned and operated by the Swan family since its founding in 1987, Adventure Canada operates trips in northern Canada on land (Churchill for polar bears, Baffin Island for narwhals), as well as by sea. Cruise itineraries focus on remote regions of Canada's east coast, including Labrador and the High Arctic. The voyages run from June to mid-October and typically include the Saint Lawrence River, Greenland and the Northwest Passage, plus an annual circumnavigation of Newfoundland. The line also sometimes offers a winter cruise to Antarctica. In 2011, Adventure Canada took over the Inuit-owned Cruise North Expeditions, which has been fully absorbed into the company. Adventure Canada cruises provide a refreshing alternative within the expedition cruise industry by featuring crew who are local residents of the cruising area and often hired for a single voyage. The company combines expeditions to rarely visited Canadian Arctic regions with a strong emphasis on local culture, history, nature, wildlife and music (provided by multi-talented naturalists, geologists and historians). There is no formality onboard. The friendly, often folksy atmosphere trickles down from the top, and the company is about as non-corporate as you'll find in today's cruise industry. A part of Adventure Canada's mission is to support local projects and preserve the environment in the areas where it cruises. To help fund these efforts, each passenger is billed a separate Discovery Fee, presently $250. The company goes out of its way to employ residents of local communities, be they Inuit or Newfoundlanders, to make presentations about their culture and arrange visits to local communities. Built in Poland in 1982, 198-passenger Ocean Endeavour is Adventure Canada's favored charter ship for exploring Canada's Arctic, Newfoundland and Greenland. Adventure Canada expedition sailings to the Canadian Arctic are very much focused on wildlife, nature and local lore. Life onboard is casual, friendly and relaxed. You won't find anything remotely fancy or formal -- and forget about production shows. You're more likely to be invited to a sing-along or hilarious word game. The emphasis is on learning, with lectures on topics that range from the ecology of the poles to life in a Newfoundland outport, along with traditional Inuit games. Expect one or two shore trips by Zodiac each day, and accept that itineraries will be altered based on wildlife sightings, the changing weather and ice conditions. About 70 percent of passengers come from Canada, with the rest split between the U.S., Australia and Britain. The average passenger tends to be in his or her 60s, with many repeaters and a surprising number cruising solo. No doubt the offer of a limited number of cabins with no single supplement plays a key role. There are generally some family groups onboard as well, including small children or teens. Passengers are fit, well traveled and keen to learn about the region they are visiting. Adventure Canada charters expedition ships on a seasonal basis. Ocean Endeavour has been the favored vessel for summer Arctic expeditions since 2014, replacing Sea Adventurer. The 198-passenger, 12,907-ton Ocean Endeavour was built in Poland in 1982 and is ice-class rated 1B for polar exploration. The most recent renovations took place in 2016. The ship features a pool, hot tub, saunas and gym. All cabins have a private bathroom and TV. Views are either through windows or portholes. Fifty cabins are interiors, including a quad and three triples for families or singles willing to share. Adventure Canada occasionally charters other ships for specialty sailings, including Island Roamer, a 13-passenger, 68-foot ketch, used for trips to British Columbia's Haida Gwaii. The 100-passenger, all-suite Hebridean Sky, formerly known as Sea Explorer, was built in 1991 and cruises to Antarctica. That ship underwent a $10 million refit in 2016. As a Canadian company, Adventure Canada focuses on remote regions of Canada's east coast, including Labrador and the high Arctic. Itineraries scheduled for summer months typically include Greenland and the Northwest Passage, plus an annual circumnavigation of Newfoundland. On occasion, a mid-October cruise to Antarctica is scheduled.